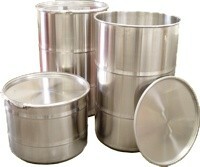 Drum Systems is the specialist supplier of stainless steel drums and barrels We been manufacturing and supplying processing and handling equipment to the pharmaceutical, chemical and food industries for the last 30 years. Drum Systems is a trading division of Terriva Ltd.
We specialise in supplying high quality equipment to the pharmaceutical and other hygienic industries. We have all the right quality systems in place to document our high quality vessels. Drum Systems is a division of Terriva Ltd. This website and all its contents are copyright. Reproduction in any form is prohibited without prior permission.